The Country Porch features the Lake House Decor collection of home decorating accessories from Park Designs. Inspired by elements prevalent at the lake of watery blues, cattail browns and driftwood grays. 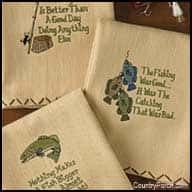 Lake House offers a fresh complement to our popular Fish Camp giftware. Textile accessories feature the artwork of Daphne B. View our entire Lodge Decor selection or return to our home decor catalog.